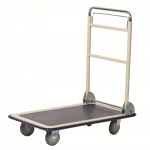 Platform carts help you move stuff around the office with supreme convenience. They’re little platforms close to the floor with a vertical handlebar and four wheels on the bottom. It’s a great way to transport all those office supplies to and fro. Employees will love them. There won’t be any manual hauling, carrying, or the like anymore. 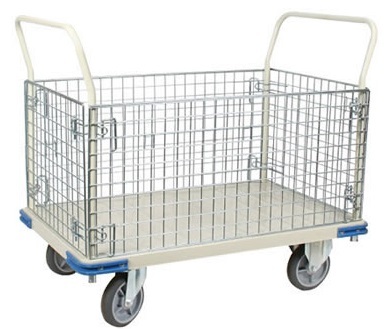 Platform carts are minimalist, neat little devices that make moving indoor items easier. Available in 2 different weight capacities! Let’s take a look at some platform carts so you can get a better idea of what they do, what their specs are, and how they work. Westco 272076 Aluminum Folding Handle Truck – this folding handle truck weighs just 22 pounds, measures 18.5” x 29”, and it has four swivel caster wheels that can carry a total load of up to 330 pounds. There are rubber-coated corners, a true innovation, that will make it extremely easy to protection your walls, furniture, objects, and shins from damage, scratches, indentations, and dents. The rugged, strong build of the handle truck will help it handle anything that you need it to. This is a great truck for the office. You will love moving around stuff at the office. It will enable you to get a lot more done in a tough, cramped office environment. Westco 272250 Telefolding Hand Truck – the folding platform truck can go out to a reach of 28 inches or stay in to within 20 inches too. It can easily fold down to the size of a briefcase too for easy handling. It has protected corners which are covered in vinyl to protect the indoor environments. It weighs 19 pounds, has 4” wheels, and it measures 16” x 20” to 16” x 28” at its most expanded reach. ·Westco 272946 Bi-Fold Poly Holding Handle Office Cart – this bi-fold folding hand truck is deal for the office. It can be put into one of three positions. You can tilt the handle at an angle so you can put it into pull or push mode. You can even put the handle down completely flat to use the machine as a dolly. This is a great boon because it saves you money on a dolly. The handle will fold down completely over the platform, and it will never touch your cargo, so your cargo will stay flat on the platform. One of the unique benefits about this hand truck is that it only weighs 11 pounds, but it can carry over 400 pounds. It is made of tough materials. 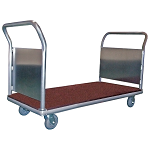 Some platform carts can come with push-button release, anti-impact corners, and non-skid decks. Most platform carts will require some assembly though. The instructions will usually be provided by the manufacturer. Some platform carts have very wide platforms so they can fit very big objects. They are very wide so they can accommodate larger objects for which commoner, narrower platform carts won’t cut the mustard. If you need to move heavy musical equipment, a platform cart can really help. There are multiple uses beyond the office. Often, home improvement projects will require them. Home improvement projects, hobbies, garage endeavors, and projects will require them. They just help to easily move a bunch of gear around a small area. Make sure that the platform carts you get are big enough to get the job done. Make sure they are easily collapsible and can fit into storage. This will help ensure that they meet all your needs, both on and off the job. Try to determine the dimensions of the objects you are going to be transporting. Then, purchase platform carts accordingly. Determine how many objects are going to be moved on a daily basis, and purchase a number of platform carts in concordance with that. You should also designate one platform cart for each employee. You don’t want multiple employees sharing the same platform cart if they have to do the same work. Make sure that each person has what he needs to move everything around on a daily basis. Platform carts will have some use in any setting. Even used in homes, they have some sparse uses. Moving stuff around that you would otherwise have to carry with ease and precision is something that most people want. However, they only really work on hardwood, concrete, and tile floors. Try to determine the precise and accurate uses of the platform cart before you buy it because they will all be a little different. Don’t count on one just doing everything. Are you a contractor, then you need a platform cart! 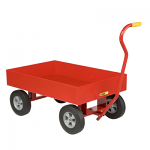 Come browse our wide selection of platform carts that are perfect for lugging all your construction needs. If you have a retail store you may also be interested in our platform carts too. Make us your last stop as we offer the best prices and we guarantee that! 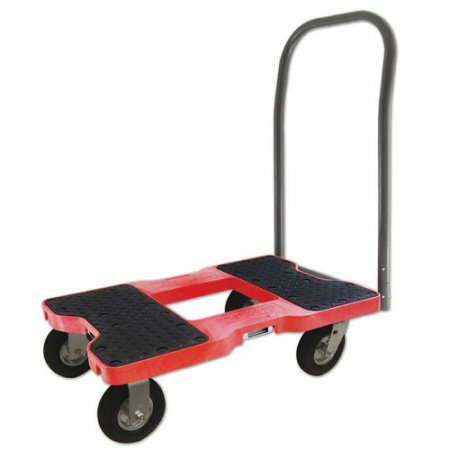 You will find the perfect Platform Cart at Handtrucks2go!